“Hi hi” from Oslo. I’m here attending the opening of “Recycling the Looking Glass, Trash Art-Found Objects” a wonderful group show curated by the incomparable Samir M’kadmi. Much, much more will be posted here about the show, the contributors and organizers. At the moment, I’ll throw up a couple photos from the opening seminar and the piece I submitted to the catalog (my talk was basically a longer version of what’s below). 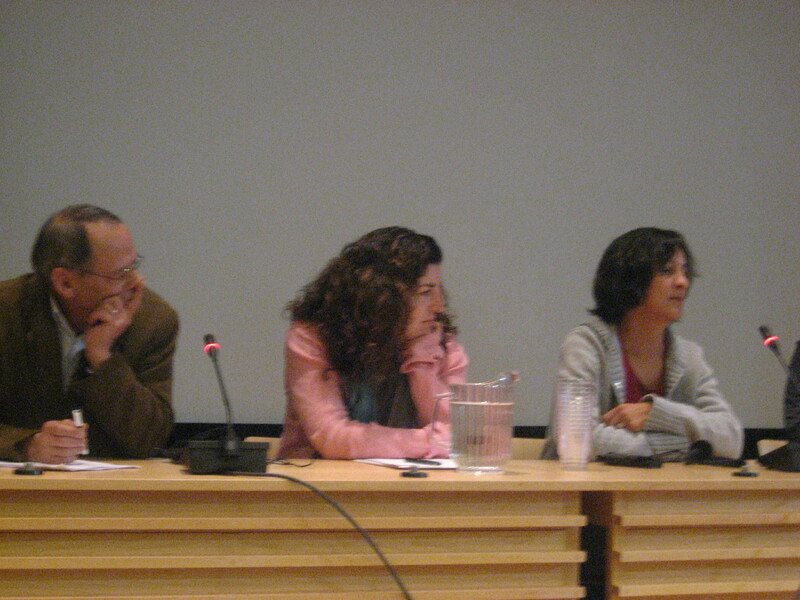 Other panalists included a feminist art critic, an economist and an ecologist who uses trash art projects to teach kids about the environment. Two artists also gave talks. Stay tuned for less Leila-centric posts very soon, I have met amazing artists and art world peeps from all over the World this weekend and can’t wait to share the virtual booty with all of you! My obsession with trash began when, as a journalism student in New York City, I started researching the unimaginable number of tax dollars spent each year transferring garbage from my hometown to places as far away as the middle of the country. New York closed it’s only landfill in 2001 with no immediate plans for what to do with all the trash created by the millions of local residents and businesses. The immediate solution was to export the waste to other states, an expensive venture involving enormous contracts with private waste haulers. Previously, the city had evacuated the majority of its trash on barges pulled by tugboats. This new plan created a billion-dollar-a-year industry and added significantly to the number of trucks circling the already congested city streets. Not surprisingly, the poorest neighborhoods bore the brunt of these changes. In order for the garbage to be moved long distances, it had to be emptied from local dump trucks and packed up again into larger vehicles. This transfer of trash—a smelly process that attracts rats—continues to take place in several of the city’s poorest neighborhoods. While the story I was writing focused on local politics, my fascination with garbage extended far beyond the United States. I started to see trash as everything from an indicator of poverty to a medium for art. Before long, everyone I knew associated me with trash and when they came across related factoids, I would receive an email. So I started a blog. The Internet seemed to be the perfect outlet for these tidbits and the perfect venue to start a larger conversation. The wonderful thing about the World Wide Web is that if you have a pet interest, it is easy to locate whole communities of people who share that interest. And so it was for me with trash. Soon after launching everydaytrash.com, over two years ago now, I discovered a universe of other sites dealing with interrelated themes. Because my interest in the subject had grown from local politics, it took me some time to think of everytrash.com as an environmental or “green” blog. My audience had no such doubts. I quickly realized that the majority of people interested in trash are interested in reducing waste and approach the issue in terms of saving the planet. I came across people keeping track of their own waste online, weighing their garbage each day and trying hard to make less the next. And there were sales sites, marketing niche environmentally-friendly products to those willing to pay a bit more for a clear conscience. There appears to be a huge market out there for reusable tote bags, organic baby clothes and business card holders made from recycled gasoline. It doesn’t take much exploration into the world of trash to see that, fundamentally, trash is an economic and class issue. Only those less fortunate ever have to worry about what happens to what society discards. The rest of society, on the other hand, sleepwalks through life believing that trash disappears the moment it hits the bottom of a trash can. Early on in the life of the blog, I became interested in trash pickers, communities of people who go through the trash and find new uses for what others have chucked. In Argentina, China and Egypt and probably many other places, there are words for these people and the practice is associated with very particular ethnic groups. In many other places, people supplement their income by collecting and redeeming cans or hunting for and selling scrap metal. Sifting through the smattering of articles that pop up each year on trash pickers, I am constantly reminded of the wastefulness of the era I live in. "Garblogging" translated in the English/Norweigan catalog--love it! Once you notice trash, it’s hard to ignore. Around the time I was pouring through New York’s solid waste management plans, my job at a public health nonprofit began taking me to Africa. There, I encountered a relationship with material goods entirely foreign to me. Terms like recycling and zero waste have no place in these societies where value and lifespan of any given product are given their full respect. In places where people have very little, these concepts are organic. I met a roadside tailor in Malawi who spent his days mending the worn clothing of local villagers, squeezing extra days, weeks and months out of the worn fabric. In Uganda, women from the North, an area burdened by enduring violence and high rates of HIV/AIDS, form beads out of old magazine pages that they then shellac to create brightly colored bracelets and necklaces. Women in Kenya collect floating flip flops from the ocean to refashion into crafts to sell; one project has even created a giant whale out of the discarded plastic shoes to raise awareness about the dangers of plastic waste to marine life. Plastic bags in Burkina Faso are twisted into small dolls and sold to tourists. While the African cultures I visited varied dramatically, the unmistakable smell of burning garbage welcomed me the moment I stepped off the plane and onto the tarmac in a new city. In fact, many of the news articles I read while traveling focused the depletion of Africa’s resources and the threat of disease. The contrast between the joyful and hopeful efforts of the beaders and doll makers and the overall pessimism of news coverage on Africa fed my enthusiasm for blogging. I was glad to have a forum to highlight positive, homegrown responses to seemingly overwhelming problems. 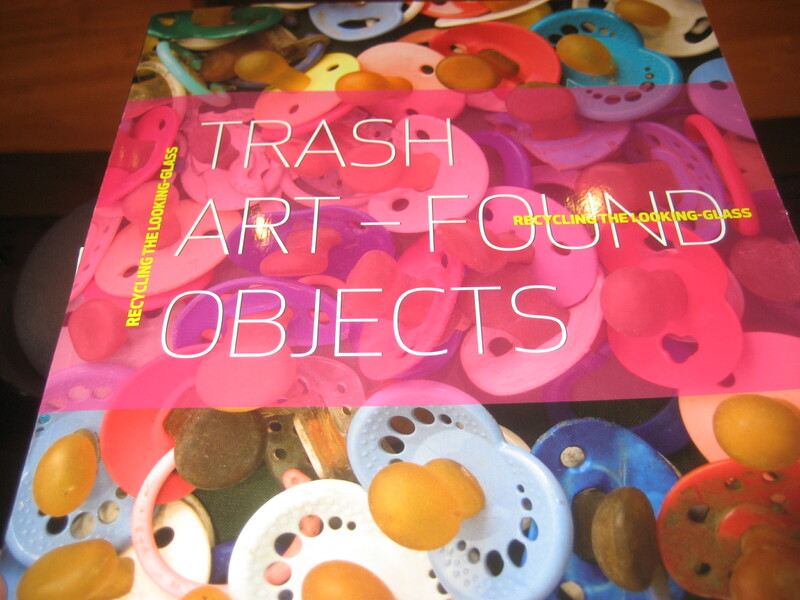 Of course many positive approaches to the subject of trash come from the artistic community. Through everydaytrash.com, I have discovered “trashion” designers who create fantastical outfits from discarded items as well as countless artists who use trash as a dynamic medium with which to create provocative pieces. What I love most about these works is their effortless incorporation of an often dense political topic. Trashtastic! This entry was posted on Saturday, April 5, 2008 at 9:21 pm and is filed under Artistic Trash, TRA$H. You can follow any responses to this entry through the RSS 2.0 feed. You can leave a response, or trackback from your own site. great article, been a fan of your blog for awhile now. i linked to this post. If you liked my piece, you’re going to LOVE the stuff on the artists and curator! Stay tuned and thanks for the link, it’s much appreciated! I got a chance to skim your entry to the catalogue and check out the photos. It’s nice to see Bead for Life getting a shout-out, and I love the idea of a “trashion” designer. Great job! a totally different subject but it has pretty much the same layout and design. I have learn this put up and if I may just I desire to recommend you some interesting things or tips.